wearecity had the most liked content! True, a dx is the best and sometimes only way to enjoy these old lesser known machines. I can visually see a machine when playing classic layouts of modern machines I've played or real classics like Red Hot Roll or Cloud 999. But it's difficult when you don't know what the machine looks like. Not seen these machines before, hadn't played Bolt from the Blue before it was emulated. So I guess the burning question is what does DJE stand for and can more of their machines be emulated. What is this fruit machine? The cashpot question, will remain a mystery forever I reckon. It caused some confusion at the time and when the layout/s were released. A few things that were strange/annoying about the machine. You can never hit the P on the word stop, if you have the dapple on the ? on the lemon, rather than skill stop, unless it's the only letter unlit. Also the hi-lo giving the same number was strange, but it could make you sometimes think, hmm perhaps I should just collect. The top hi-lo big money was a risk, because you could end up with just £1. In general there is some amount of thinking to be done as to what the best thing is to take or try for, because it's not always the one you think is best, such as taking the trail with the bonus life or a particular feature, depending on the reel set up. Top Stop was one of my most wanted machines to be emulated, then Wizard got the machine and he supplied the roms and Geddy/Dad the layouts. Still think it's one of the better Barcrest of the time, probably just better than the super 2 machines. I too played it at Butlins, but at Bognor Regis would have been aged between 18-21 I reckon. 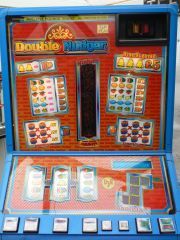 It was in the late night takeaway, used to play it while waiting for my Butlins burger with their own relish to be cooked. I don't regret playing it as I won more on it than I lost, but I always regretted the burger the next morning. Thanks to all involved in this release. A much requested machine over the course of FME. Wow great job, a huge difference. There is a free emulator which you can play this and thousands of other old fruit machines, all for free. Check out the MFME sections on these forums https://www.fruitemu.co.uk/ib/index.php?/forum/17-fruit-machine-emulation/ and also register at www.desertislandfruits.com and www.fruit-emu.com Do a YouTube search for MFME to see the emulator in action. When you look at some of the later MPU4 stuff from the mid nineties, it's hard to think machines like Reel 2 Reel are based on the same tech. It's like the people in Barcrest were cautious and thought ok we have MPU4 technology, but we don't really know what it can do, so let's tread carefully and produce something that looks and sounds like MPU3. A bit like when a new console comes out and early games, don't really show what the technology can really do. Oh I thought there was something more exciting than a smelly 5p version. Looking at the picture on this thread an £8 jackpot as well!!! Apart from the colour, what's the difference between the as Ploggy says "proper" red Eastenders and the blue Eastenders. Crazy Coyote is emulated by Spa see the thread below for the download and some discussion about other similar machines. These were fun machines back in the day. Cash Pack is one of several early M1a/b machines, that were amongst my favourite back in the day. Looks in near mint condition as well. 30p for 2 symbols, not sure I've seen that before on a £4.80 machine. Perhaps a way of Maygay, selling it, saying it wasn't just the 80p extra in the jackpot amount, that had been upgraded with the new high jackpot. Take Note, was/is a clone of this and is emulated (although it certainly could do with a makeover if @vectra666 has the required artwork etc...) Manhattan Skylines in the same style cabinet, although gameplay is different. It's still one I return to on the emulator, several times a year. Amazing to think it's the same tech that Eastenders/Noel's House Party etc, was built on, although I guess that's more b than a, if they are separate strands within the tech.